Ground Penetrating Radar Systems, LLC. of North Carolina was requested on site in Downtown Charlotte. The customer needed rebar and post tension cables located before they could drill for anchors for a new data rack. GPRS located the rebar and post tension cables within the slab in the designated area to allow for the holes to be drilled for the anchors. 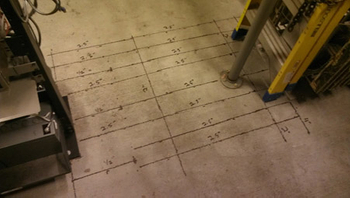 All findings were marked directly on the surface to map the existing reinforcing steel. Ground Penetrating Radar (GPR) is an ideal solution to locate existing reinforcing steel before drilling holes in concrete for anchors. GPR is a fast and safe way to 'x-ray' through concrete. For more information about Ground Penetrating Radar in the Charlotte, North Carolina area, please contact Curtis Hoag of Ground Penetrating Radar Systems, LLC. at (704) 582-3219 or curtis.hoag@gprsinc.com.